Which flavor of COE is right for your enterprise BPM strategy? Good governance leads to good performance. 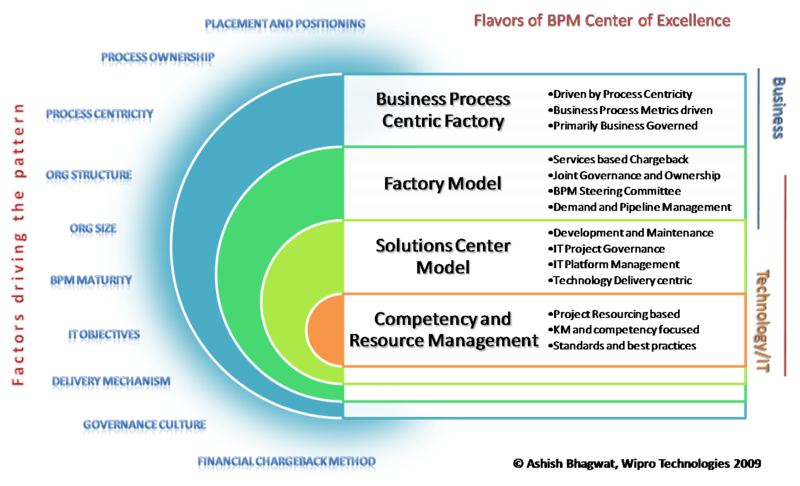 BPM COE (Center of Excellence) is essential to an enterprise BPM strategy. However, positioning of the COE within the organization is a key success factor. There are various flavors of BPM CoE that serve different purposes and most organizations would go through some of these before reaching the right positioning and right level of maturity. During my experience I have found various flavors of BPM COE – sometimes in combination, sometimes in progression. The figure on the left describes these patterns of BPM COE, and I think it is pretty self-explanatory. Still, it needs to be pointed out that this is “not” a maturity model for a CoE. And there is not necessarily an entry-level pattern as Competency & Resource Management may look like. However, that one would make sense to start off with if the organization has no real experience with BPM. Competency & Resource Management – Focuses on competency development and resource management, and formulating the knowledge frameworks, standards, methodologies and best practices. The primary focus being brainpower and not necessarily as a hub for all the hardware and software requirements too. Solutions Center Model – for organizations that have a little better laid out plan on the iniatives on BPM implementations, this model would provide a more efficient delivery and governance around initiatives. This, however, still resides more on Technology side due to the nature of the projects. Factory Model – This offers a better chargeback and resource usage mechanism between the business needs and Technology capability. This also works better for a more well-defined BPM strategy where the definition of the projects are more tuned to the business process objectives and enterprise strategy. This moves governance closer to business and a better handshake is possible. Business Process Centric Factory – This is driven by the process centricity, the KPIs and the process improvement objectives. The Process owners more involved throughout the initiatives and really help focus on business outcomes. Which flavor works best for an organization depends on variety of factors. The factors are so many that sometimes we see a combination of the 2-3 patterns in a CoE. For instance, I have seen two COEs operating in the same organization – one focused on the Process Definition and another on Process implementation – and there were still gaps on the execution & monitoring due to the lack of business owners’ involvement. In another place technology owned a Factory model based CoE and the projects looked more like IT implementations and less oriented to process improvement. While in another case, business started off with a COE and started driving some of the initiatives while technology was not aligned resulting in solutions not keeping pace with the business needs. As I mentioned in the beginning Governance is key. CoE could lead to a well governed enterprise BPM strategy, but CoE plan also needs a good governance around it and right positioning in order to achieve that. Some thought must be given to which flavor of COE really does your enterprise BPM strategy need. This entry was posted on February 25, 2010, 6:06 pm and is filed under BPM, Business, Management, Technology. You can follow any responses to this entry through RSS 2.0. You can leave a response, or trackback from your own site.